Chapter 1: Ruth is on the train totally refusing to cry. Kind Dr. Davison invites her to be his friend. OMG! Danger, the train pulls to an unexpected stop! Chapter 2: Ruth boldly goes with the other Ladies to see what’s on the tracks. It’s a huge wounded dog wearing a headlamp and a collar that says “Reno, Tom Cameron’s Dog”. Ruth is good with dogs. Wound into the collar and electric light is a rag with “Help!” written in blood! She takes the dog with her on the train. Chapter 3: Uncle Jabez is not waiting for her at the station. She meets another man, Jasper Parloe, who is cryptic and shabby, with patched garments and chewing tobacco stains dribbling out of his mouth. He speaks in amazing dialect. He won’t help Ruth search for Tom Cameron! Dr. Davison intervenes and forms a search party with Ruth and the dog! Tom Cameron has had a bad motorcycle wreck and is found in a ditch, unconscious, muttering “Jabe Potter, he did it!” Ruth has a bad feeling. Chapter 4: Ruth walks back alone to the train station with only a dollar in her pocket. The kind stationmaster, Sam Curtis, takes her home with him for the night to his wife and Mercy. Mercy is a whining, shrill, horrible girl about Ruth’s age. “I don’t want her to see me! They come in to stare at me! I hate ‘em all! All girls do is to run and jump and play tag…” Mercy has “a wheel-chair such as Ruth knew were used by invalids who could not walk.” Ruth leaves in the morning, taunted by the poor unhappy lame girl, and runs into beautiful, vivacious Helen Cameron driving a big grey car! Helen thanks Ruth for saving her brother and drives her to the Red Mill. Chapter 5: Helen declares they will be the best of friends! She’s a year older than Ruth, and Tom is her twin. Ruth reveals that her beloved friends in her old town were all too poor to take her in. Helen explains that Uncle Jabez is a bit mean and stingy. She invites Ruth to live with her and her brother and father in their big rich house, if she can’t get along with her uncle. Uncle Jabez doesn’t really apologize for getting the train arrival time wrong, and he doesn’t smile, and warns her sternly that she’s going to have to work hard. Almost blinded by tears, Ruth holds her head high! Chapter 5: Aunt Alviry says “Oh my back and oh my bones” for the first of about 9815512875 times in the series. She hobbles and is always working at some very hard sounding housework, scrubbing or hauling or on her hands and knees. She wears the dress of an old-fashioned Quakeress. She welcomes and compliments Ruth, who finally bursts into tears as Aunt Alviry clasps her to her bosom. Ruth then falls on her knees and cries into Aunt Alviry’s lap. “I don’t usually cry. I’m going to get right to work to help you, I can stoop better than you can”. Awwwww! Aunt Alviry then figures out that Ruth has come to live there. “Did you come from the poorhouse?” Ruth freaks. Alviry says that Jabez is stern, but kind in his own way, because he took her in and let her work when no one else would take an old woman without a home. I have mislabelled some chapters. Oops! Chapter 8: Alviry reveals that Jasper Parloe used to work for Jabez and they hate each other and fought over money. The mill is dusty and dreary. Everyone works hard! There isn’t quite enough food. Uncle Jabez locks his money in a miserly way into a small box in his office. Helen stops by to visit. It rains, and Jabez counts his money. Dr. Davison warns Jabez to open his sluice gate, because the dam upstream may break. Jabez refuses because if the dam doesn’t break, he won’t have any water in the summer. Chapter 9: DO YOU THINK THE DAM MIGHT BREAK? I DUNNO! Helen and Tom come by and Ruth has her second ever ride in a motor-car! They drive up to look at the scenic Minturn Dam. OMG! The dam! It bursts! Helen drives the car fast as lightning back to Cheslow to warn the people downstream. She’s a good, strong driver! Good thing, cause Tom still has a broken arm from his motor-cycle accident. Chapter 10: “The two girls on the front seat of the flying automobile were not prepared for racing. Of course, Ruth Fielding had no proper automobile outfit, and Helen had not expected such an emergency when she had started with her crippled brother for this afternoon run. She had no goggles, nor any mask; but she had the presence of mind to raise the wind-shield.” They warn everyone! They are heroes! Ruth sees Jasper Parloe run out of the mill, shiftily! Chapter 11: Aunt Alviry, terrified of the flood, waits for death in her rocking chair reading the Bible. Uncle Jabez returns driving his mule team! Part of the office has been swept away! The cash-box was in it, omg. Tom Cameron coolly advises him he should keep his money in the bank! But reveals that Parloe was sighted in that very office, sneaking! Jabez tells Ruth grimly that 40 years ago he lost every penny when the Cheslow Bank failed, so he kept his money close. Every penny was in that box! Chapter 12: Ruth is so sympathetic to Uncle Jabez that he begins to warm to her. Ruth finally determines to speak up to him about going to the local schoolhouse. Aunt Alviry supports Ruth’s desire for more education. Jabez agrees. He then reveals her trunk from the station was washed away from the mule cart, in the flood. Ruth has lost all her clothes and possessions. Chapter 14: They all pick buttercups in a meadow and discuss the lost cash-box. Ruth confesses that Jabez will let her go to school, but there’s no money and she doesn’t have the clothes. She only has one dress. They go home and come across Jasper and Jabez arguing. Do you think that maybe Jasper Parloe stole the box, or found it in the flotsam? OH I DUNNO! Chapter 15: Ruth stresses about her ugly, shabby dress. The teacher puts her in an advanced class sitting next to Julia Semple, who’s super mean! Ruth proudly determines not to made advances towards the other girls in her class. She’ll try to graduate from the schoolhouse straight into Cheswell High! She’ll make her teacher approve of her, and her uncle love her! But he’s moody and unkind. Chapter 16: Aunt Alviry promises to get her a dress, though she doesn’t have any money of her own, since Jabez has never paid her. Dr. Davison visits to say she should visit Mercy the lame girl, who though so sharp tongued, has read every book in Cheslow. Aunt Alviry reveals that she will soon have not just one, but three dresses! Chapter 16: They are nice, colorful, pretty gingham dresses! OMG! Ruth gasps! Helen and Ruth go to Cheslow and call upon Dr. Davison, where his “colored cook, Mammy ‘Liza”, and a “little colored girl” with, god, I can’t even go into how they describe her hair as “wool”, but they do… serves them with the most delectable pastries ever. SIGH. First moment of racefail. I didnt’ remember it, though I do recall the gypsies in a later book: a series like this *has* to have a gypsy episode. So, rather than there being no black people, there totally are but for no particular reason other than to establish whiteness and its perks. Want to bet that Ruth will rescue every single girl she ever encounters and get them a great education, new gingham, and jobs in the nascent film industry, all except for Mammy ‘Liza’s shy, sweet, pastry-serving daughter, who doesn’t even get a name? Meanwhile, Dr. Davison advises Ruth to go make friends with Mercy, who likes her and hates Helen for being too pretty and rich and lucky. Helen bitterly remarks that Mercy is mean. Ruth guesses she can stand a bit of name calling for an hour if it will make the lame girl happy. Chapter 17: Ruth and Helen overhear some little girls pitying (and afraid of) Mercy. Mercy hears them, makes a face and shakes her fist out the window. Mercy’s mother says it is one of her days of torment. Mercy runs her wheelchair threateningly at Ruth and snaps at her that she wishes she could break her legs! Ruth silently resolves never to run lightly in front of the poor crippled girl again! Mercy doesn’t like to go out, because people are so mean. Ruth says she could come visit with her chair and see the Red Mill, and the baby chickens, and the river, and so on. Chapter 18: Blah blah Jabez and Jasper. Ruth plans to go and visit Helen. Uncle Jabez forbids it! For a non-crying girl, Ruth sure turns on the faucets here. Uncle Jabez is unfair! She and Helen write passionate letters! Ruth determines to throw herself into her studies. The spelling bee is nigh! Chapter 20, UNCLE JABEZ IS MYSTERIOUS: Ruth is appalled about the dresses. Uncle Jabez begins to shine! “Are ye too proud to wear dresses that’s give to ye?” demanded Uncle Jabez. “Ye ain’t too proud to take food and shelter from me. And I’m a poorer man than Macy Cameron an’ less able to give.” Ruth begins to stress about her lack of a white graduation dress. Chapter 21: Do you think Uncle Jabez is about to buy her a dress because he secretly has a heart of gold? I DUNNO! Yes! He takes her into a dry goods store and tells the saleswoman to help her pick out goods for a white dress and the pattern and things that will go with it! Ruth is stunned. She visits Mercy, who likes the look of Jabez because he looks grumpy and fierce. Chapter 22: Uncle Jabez agrees that Mercy can visit. He thoughtfully considers the wheelchair accessibility of the house! Woot! Tom Cameron gives Ruth a ride to town and reveals that Jasper Parloe has been blackmailing him by threatening to reveal that it was Jabez who caused the motorcycle accident, which Tom doesn’t want revealed for Ruth’s sake! Chapter 23; Mercy comes to the Red Mill and has a fabulous time! Uncle Jabez makes her some crutches! He likes her feisty teasing! Away from the prying eyes of pitying people in town, she practices a lot with the canes, and becomes pink cheeked and healthily plump. Dr. Davison brings a New York City surgeon to visit. Chapter 24: Tom and Ruth see Jasper Parloe gloating over a locked box in the woods! OMG it’s Uncle Jabez’s japanned box! Chapter 25: Jasper Parloe is just a bit crazy and sly! His favorite swear words are “Jefers-pelters”. Uncle Jabez freaks out with joy! All the money and the stocks and securities are in the box, untouched! Tom confesses about the blackmail. Jabez lectures him. Mercy gets an operation by the famous surgeon in a sanitarium! She will – in time – walk again! Though in all the books I remember she still was often in pain and used crutches. Surprise! Uncle Jabez is going to pay for Ruth to go to Briarwood Hall with Helen! Yayyyyyy! I have never read these and now I either desperately want to or feel that I don’t need to since your liveblogging of the book is so splendiferous. Hah! Stressing about the dress! I feel like I HAVE read it, aren’t the girls in these books always stressing about their dresses? I think there’s something about that in Anne of Green Gables, too. Oh! Hey! Another crabby wheelchair-using character, in a contemporary book called Saffy’s Angel, by Hilary McKay. 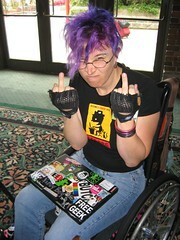 It’s British and the title character, early in the book, gets knocked over ON PURPOSE by the “wheelchair girl,” Sarah, who lives up the road, b/c she’s pissed that Saffy and her (chaotic artistic and messed-up but still loving) family have seen her rolling past for years & years & never talked to her. So Sarah & Saffy become friends and Sarah is a brilliant hellion who’s so determined to not be a good angelic disabled child that she’s gotten herself kicked out of the private school where her MOM is the principal, and then she helps Saffy with this crazy plan she has to run away to Italy, and that is all I will tell you. Except that there are five books and Sarah’s in all of them, and she gets ever cooler and hotter but I am pissed at McKay that she didn’t get her own book. I can’t believe I never thought to tell you about this book. Probably you have read it already, but just in case. OMG! I need that! Thank you! No, i’ve never seen the Saffy books and I must have them immediately! Anne of Green Gables freaks out over puffed sleeves – which were all the fashion in her school – but which waste fabric. Ruth didn’t even have the money for a basic ugly dress! I was also reminded of Elnora in Girl of the Limberlost. In the later books, Ruth is much more cool, calm, and collected — it’s only this one that she thinks about dresses and spelling bees and cries all the time. Her focus becomes kind of an obsession with becoming financially independent of Uncle Jabez rather than making him love her. 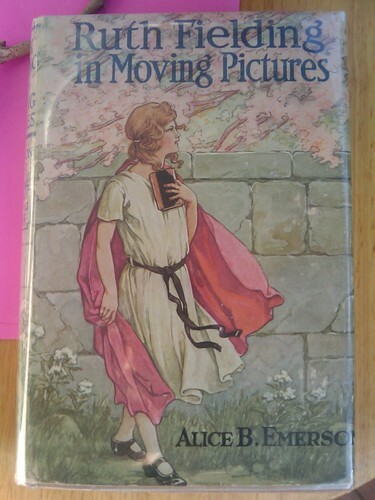 “Ruth Fielding in Moving Pictures” is my favorite one because she starts getting paid! Up till then it’s more about solving mysteries and finding the lost necklace, etc. I am leastconcern from dot_gimp_snark, and I saw your post, commented, came here. I think I have a crush on you, and your brain. I thought I was the only geek that picked out the racism of old books. Heee! *blush* Come over to girlycon! I love the first book in which Mercy meets up with Ruth’s cranky uncle & they have the best time complaining bitterly indoors together. The RFSB Awards are back- get your nominations in! Great review… This makes me want to read the book! Keep up the good work! Now it suddenly makes sense why the novels seemed so totally different from one to the next! Mercy is one of my favorite characters of all time.